Critical Paintball has released an update to the Critical Paintball Ejection Stealth Pack we reported on earlier this season. Since its release, the new paintball pack has been undergoing rigorous testing by NPPL Division 1 team Critical Paintball. A few weeks back, ProPaintball caught up with Critical’s Director of Operations Edwin Dolgopyat at Whittier Paintball Park in Southern California. We spied Edwin using a prototype Critical Pack and began firing away questions. Edwin let on that he and John-Paul have been working overtime to “develop the best paintball harness on the market” and that the new paintball pack was nearing completion. The new paintball harness from Critical features several improvements over its predecessor. The first and most significant change to the Critical Stealth Ejection Pack is the inclusion of a new paintball back pad. The new pad is very comfortable, mesh lined for breathability, and provides significantly more support when you are hauling your paint around. In addition to a redesigned back pad, the new Critical V2 Pack comes with an improved strap design. This time the straps are made with a durable seat-belt style material and look like they can take a beating. Oh, and did I mention that the straps are not based on velcro? This is a great improvement as velcro tends to go bad after years of playing and repeated abuse. Thumbs up to Critical for correcting a problem that plagues most of the paintball packs on the market. Staying true to its name, the V2 Critical “True Ejection” straps are streamlined to insure super fast pod removal once they are moved out of the way. In order to insure that the pad and straps are where you want them, Critical has added a durable non-slip material to both the pod strap and the back pad. All in all the new paintball pack from Critical is a solid paintball pack and worth your consideration. 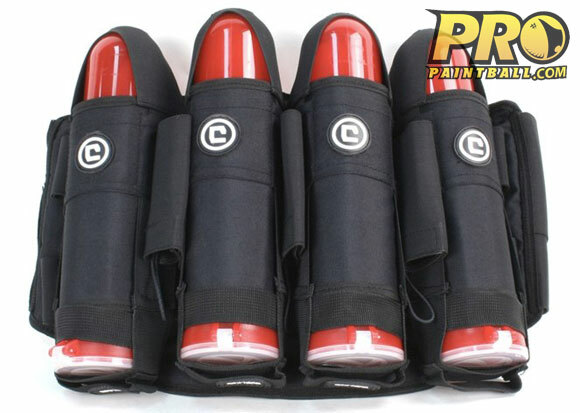 The pack is available directly from CriticalPaintball.com. The Critical V2 Stealth System is available and shipping TODAY! The new V2 Stealth Pack from Critical Paintball is a complete departure from the run of the mill standard pod pack. The Stealth Pack’s unique stirrup retention system (with True Ejection) is radically different than the standard Velcro strap design employed by most other packs. The Stealth Pack allows for much faster pod removal, and a reduced player profile while removing pods, all without the noise of Velcro. These features are incorporated into a comfortable non-slip adjustable belt with Aero Mesh padding to increase breathability and comfort. The Stealth Pack also features an exclusive pod ramp to prevent the pack from sliding down your back and the pods from snagging on your pants while you remove the pods. All of these unique and exclusive features add up to the most exceptional pack on the market.